DOYLESTOWN, PA--(Marketwired - Feb 1, 2017) - Steaz, the nation's top selling organic and fair trade green tea-based beverage company, will be making a big splash on the shelves of major retailers nationwide this month. The company unveiled a re-brand of its popular Energy line in September 2016, and today announces the debut of this new look in stores across the country. The line's new visual identity showcases easy-to-read clean labels and an original design that defines all of Steaz's flavorful and functional beverage platforms. "We're excited to bring Steaz Energy to consumers in the fresh, redesigned look that we've created," said Linda Barron, CEO of Steaz. "We believe it is important to make it easy for our customers to make better beverage choices, and clean labels are a major priority for us. 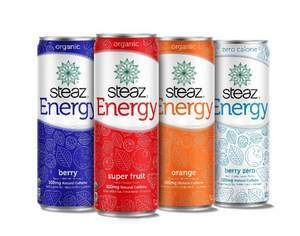 The new Steaz Energy can design is aligned with the branding, messaging and aesthetics of our entire line of popular beverages, with labeling that reflects Steaz's dedication to quality and transparency that we can confidently say is now consistent across our whole portfolio." The new Steaz Energy can designs prominently display the brand's defining characteristics, with features such as "certified organic," "fair trade," and "energy," ensuring that customers seeking such products know exactly what they are picking up when grabbing a can of Steaz Energy. Like Steaz's other product lines, including its wide variety of Iced Green Teas and newly launched Cactus Water beverages, Steaz Energy features organic green tea paired with flavorful and functional natural ingredients. Steaz accurately and voluntarily discloses its caffeine content on all Energy drink labels and ensures these levels are healthy and effective. Steaz promotes natural and organic sources of caffeine and nutrition and ask consumers to educate themselves about what they are drinking. Additional information and a full list of available products can be found at www.Steaz.com. Steaz is a brand of flavorful, great tasting, all natural, organic and fair trade green tea based beverages in three healthy and delicious product lines -- iced green teas, energy drinks and cactus water beverages. Since 2002, Steaz has continued to provide fans with better, high quality beverages while maintaining a strong socially responsible relationship with their ingredient partners around the world. Steaz' pride is anchored in their Organic certification and dedication to fair trade, supporting sustainable farming around the world. For more information, visit http://www.steaz.com/.